If you are an adventure and loves to see a beautiful landscape this place is exacly the right one for you.It is strech from the foothill of the volcano of Batukaru to the south coast. 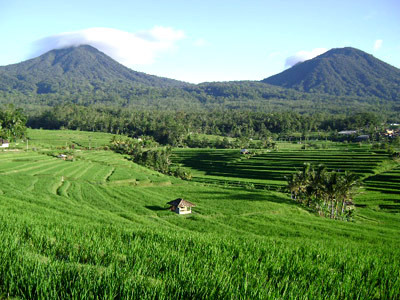 The name Jatiluwih originally mean “sangat indah” in Indonesian or ” truly marvelous”. It is deserve the name as along the way you will be amazed with the real part of Bali, the wonderful of true Balinese ambience, paddies harvesting, the flock of the duck, water buffaloes, farms houses, all that images to remember Bali in your heart. The rice terraces are the most magnificent and striking features of the landscape. When you are lucky to see the Balinese working on rice planting or harvesting, you will be welcome to join the activity, just to taste a little bit their fascinating life. Along the way, you can observe many tropical fruits and vegetation. There is also a good restaurant for you, with offcourse the background of Jatiluwih rice terrace and the sacred volcano Batukaru in a distance.